H-B Woodlawn offers different routes for students to explore their creativity through the visual arts. Those who want to develop their skills, learn new techniques, and explore a variety of media will be interested in the sequential visual arts courses. Art 1 is a foundations course that will enable all, whether an experienced artist or a novice to gain skills, confidence and understanding of art concepts. HBW’s curriculum sequence culminates with Advanced Placement Art, an opportunity for seniors to create a body of art work in their own voice. 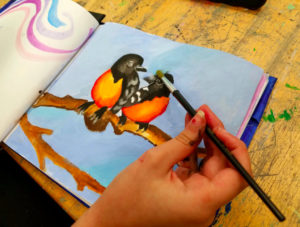 Whether the student is applying to a post-high school art program or not, the portfolio is a useful addition that supplements and enlivens the college application, along with being a fulfilling experience. For those students who cannot accommodate the entire visual arts sequence, Painting and Drawing is a course that offers an art experience with a one-year commitment. This course is available to upperclass students who wish to investigate an art concept, subject area or media within a class setting. The new Art History seminar is a student-led class which investigates art through the ages. This class offers students opportunities to explore artists of personal interest, visit art museums and become familiar with the language of visual arts in order to interpret and appreciate arts works of all genres. Throughout the year, HBW’s art students participate in peer-led critiques of their art work, and have occasion to participate in regional and national competition. Through this visual art-making, students gain skills in problem-solving, risk-taking, experimentation, time-management and persistence. At the end of the school year, packing up a portfolio of art works is a very concrete and satisfying way to measure individual growth. Join HB-Woodlawn’s Theatre Arts program! It doesn’t matter if you’re shy or gregarious, have stage experience or don’t – just come have fun – nobody will make you do anything you’re uncomfortable with, and you may discover a brilliant actor, awaiting awakening within you! 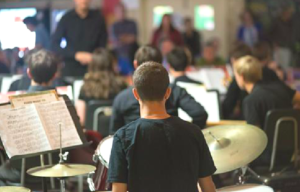 The instrumental music ensembles provide students with a safe and fun environment to work together toward a common aim of making beautiful and meaningful music, while honing and developing musical skills and understanding, and learning how to collaborate and work on long-term goals. All students are welcome to join our ensembles, whether or not they have any prior playing experience. In middle school, students can play in the Middle School String Ensemble or the Middle School Concert Band. Our high school offerings include our two concert bands: Symphonic Band and Wind Ensemble, Jazz Band, our New Orleans-Style Brass Band/Pep Band, and High School String Orchestra. In addition to performing ensemble classes, we offer Music Theory and AP Music Theory classes, where students can learn how music is written and structured. Our ensembles perform in four concerts each year on campus and participate in clinics and festivals, both locally and on our annual spring music trips. By developing their craft on their instrument, students learn the valuable lessons of individual practice, collective collaboration, and musical expression from a vast array of styles, time periods, and cultures. By participating in band and orchestra, our students experience a seven-year journey of remarkable growth as musicians and people, engaging in a creative activity that sharpens the mind, enriches the soul, and develops a life-long love of music. Singing in a chorus can be one of the most gratifying and meaningful experiences. It is a great way to meet new people, collectively create art, explore a wide variety of music, tap into human emotions, and make lasting memories. Also, research has proven that singing in a choir improves test scores, decreases stress and helps people to generally feel better. At H-B Woodlawn everyone has an opportunity to sing, and many do, with over a hundred students singing in a chorus each year! 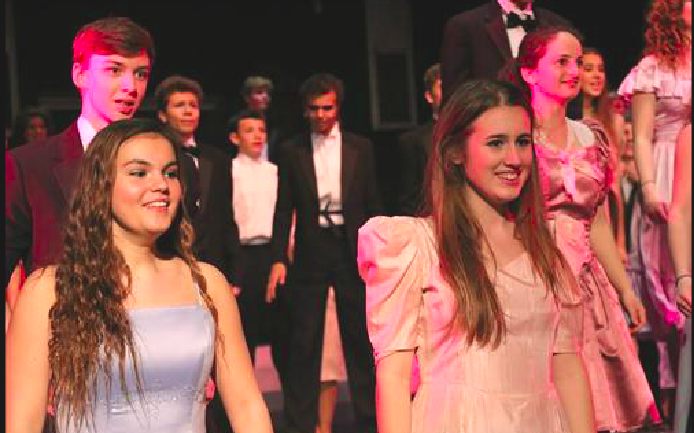 Our ensembles include the middle school boys and girls choirs, high school concert choirs for women or men, Women’s Camerata and the Chamber Singers, offering students a chance to be in a group at every level and with a range of difficulty. Photography plays a vital role in how we understand our world. Images, created by photographers, are seen daily on T.V., web sites, in newspapers, and magazines. Adults and students use their cell phone cameras to document their lives. Middle School students are interested in exploring strategies to improve their cell phone photos, learning to use digital cameras and are introduced to PhotoShop tools and photography concepts. Students may enroll for a semester in 7th grade and 8th grade.